Those who are looking for professional way of backing up data and system Recovery, EaseUS Todo Backup Free is a complete solution which can protect your system data from abrupt crashes, disasters and failures. EaseUS Todo Backup Free is a comprehensive backup utility especially made for home users for safeguarding your files which includes documents, videos, music and many more. The latest version 5.8 is a full-featured backup and recovery way out that supports GPT boot and improved third-party software compatibility. You can access the interface easily with well-organized features and tools. 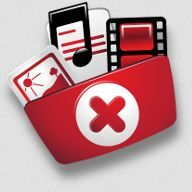 The “Home” tab includes the main options like Backup, Recovery, Clone and other tools. You can administer backup plan like editing or deleting in the “Management” tab. In “Logs” tab, you can view the recent log information of data backup, data cloning, disk partition, etc. If you want to upgrade to the full version, just click “Upgrade” tab and the rest will be easy to work on. The Home or Full version contains more advanced tools like differential backup, NAS destination, and free tech support. EaseUS Todo Backup is also available with complete features for small workstations with low price. How to Use EaseUS Todo Backup? 1. When you open the application, click on ‘Backup’ in the ‘Home’ tab. You can backup your data in two ways – File or Disk/Partition. Click on ‘File’ and select the desired files or folders or else you can click ‘Disk/Partition’ to backup entire system disk or partition. You can also view the disk information like type, size, etc. 2. Select the target location for backing up files using ‘Destination’ below the disk/partition information. You can even schedule the backup and customize some backup options. Name and describe the backup plan in ‘Plan name’ and ‘Description’ fields for future use. File and Folder Backup – Securely backup your personal data including documents, pictures, emails, music, applications, videos, and other important files. Backup complete disk or partition to image so that your work isn’t interrupted while system failures or crashes and instantly recover the data instead of reinstalling Windows and other software. You can Automatically Schedule at specific time interval, system startup or shutdown or at user session login/logout. Incremental Backup – This feature will save your time and disk space by making a duplicate of modified files since last backup. Backup Management – You can change the backup plan, execute the alterations instantly, delete image files, and convert a disk image to VMware Virtual disk format that is .VMDK or .VHD and then mount directly into a virtual machine. Mount/Unmount – You can explore or copy files to a disk and mount it to a virtual partition which is assigned by a drive letter. Also you can unmount the partition whenever needed. 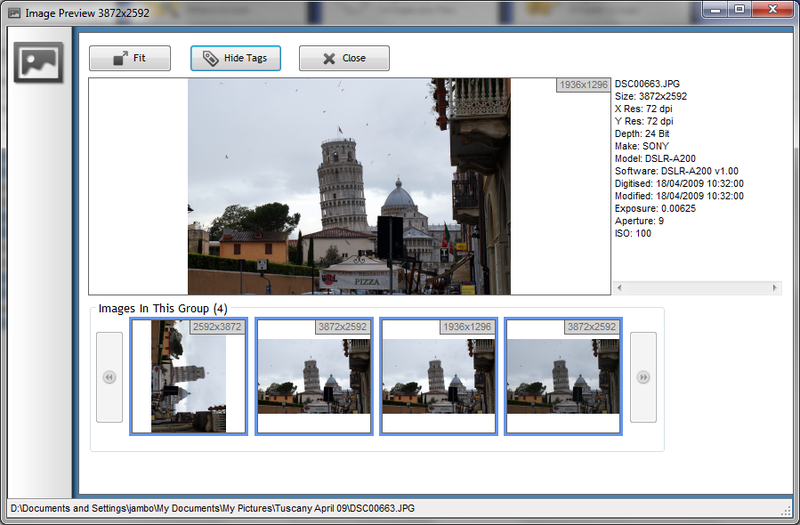 Image Splitting and Compression – Split an image to several pieces of particular size for device storage purpose. You can burn the backup files to DVD/CD. Whereas the Image Compression will save disk space by compacting the backup image with high compression level. Set Backup Process Priority to run faster or slower which lead to the performance variations. Protect your image file with a strong password of AES encryption, so that no other person can access your backup files. Disaster Recovery – Quickly restore your important files from backed up image at the time of system crash, error, hardware failure, virus attack or hacker intrusion, etc. Disk/Partition Clone – Copy or move all your data to a different hard disk without reinstalling operating systems and applications. Wipe out all your private information on the disk or partition when needed to protect your identity. Get Email Notifications of backup operations from the administrator. Shutdown or reboot computer before or after a scheduled backup with pre-defined commands. The main reason to choose EaseUS Todo Backup Home Edition is its comprehensive incremental backup which restores your computer to the original state when any software or hardware failure occurs. 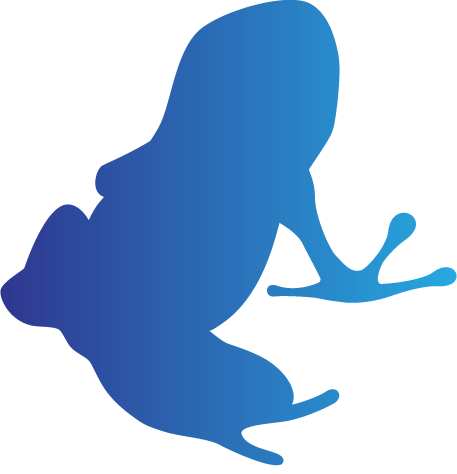 Download EaseUS Todo Backup Free Edition 5.8 from below link. There are situations that many of you won’t be able to remove programs or softwares which are installed in our PC. You need some advanced utility to uninstall programs absolutely in no time without affecting the computer functionality. 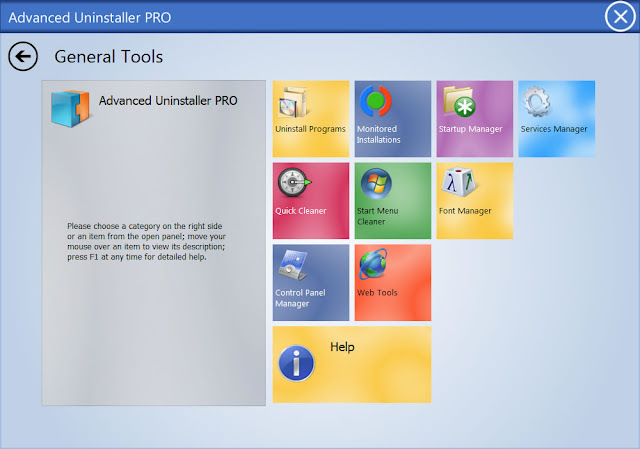 Advanced Uninstaller Pro is one of the most advanced uninstaller for Windows operating system available in the market with professional features and intuitive interface. 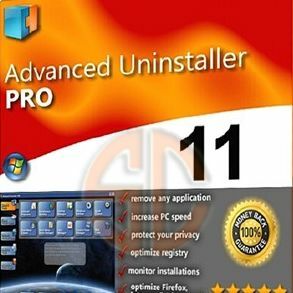 Advanced Uninstaller Pro 11.17 is the latest version obtainable from its official website which has few enhancements and bug fixes that can lead to more efficiency in its application. With Windows 8 compatibility, the interface has also changed to Metro-style satisfy the touchscreen customers that offers better user experience. Advanced Uninstaller Pro is also fully compatible with other versions of Windows such as Vista, XP and 7. How Advanced Uninstaller Pro Works? There is a feature called Installer Monitor which is included in the program, can watch the complete activities of your computer such as what softwares are installed, whether they are installed properly, etc. The program remembers activity changes so that when it is to uninstall, it makes sure no traces of the software are left behind. Advanced Uninstaller Pro cleans non-functional Start Menu shortcuts, repairs broken registry entries, uninstalls annoying web browser toolbars and many more that slow down your computer. The Interface as said is inspired from Windows 8 Metro-style with tiled tabs namely General Tools, File and Registry Tools, Internet Browser Tools, Reports, General Settings, and Help. The General Tools includes options to uninstall programs, monitor installations, manage startup services, clean start menu entries, and manage fonts. Uninstall programs and applications in your computer so easily and quickly than Windows default Control Panel uninstall wizard. Clean, Optimize, backup and restore the Windows registry entries. You can view reports or logs on installed programs. You can find programs and applications quickly with a handy search function. You can enable, disable or uninstall Control Panel icons. No traces are left behind after the programs are uninstalled. You can manage fonts installed on your computer with “Font Manager”. You can automatically find and remove the non-working shortcuts on your desktop and Start Menu. You can also show, hide or sort your Start Menu shortcuts. Remove annoying internet browser toolbars, plug-ins and Browser Helper Objects. Delete recently used documents and programs such as WinAmp, MSN, Microsoft Office, Windows Media Player, etc. Delete Internet browser history like visited web pages, cookies, etc. Shred files and folders that cannot be recovered defending your privacy. Can remove a lot of items that other uninstallers don’t even handle. Takes very less system resources without affecting the computer performance. Most of the experts recommend Advanced Uninstaller Pro to every user ranging from rookie to professional. Download the latest version Advanced Uninstaller Pro 11.17 from its official website. You may not find files or folders in your PC which with the same label replicated by other softwares installed on your computer. And no novice user can find those files quickly. Those may be duplicate documents, music, photos and other files which may cause potential damage to your PC. Duplicate Cleaner is an immensely helpful PC utility that cleans up clutter from your hard disk drive easily and safely, saving space and time. Duplicate Cleaner however has the intuitive user interface to find same or similar files differentiated by dates and sizes. Click “Select” to see the available files. You can search by folder, file type or filter criteria. You can also limit the range of file size. The latest version of Duplicate Cleaner 3.0.1 has added manual with contextual help buttons for easy understanding. Let’s see the complete features of Duplicate Cleaner 3.0.1. Look for duplicate files and folders with customizing your search by file types, dates, sizes and more. You will also get an option to search specific drives and folders such as in Zip archives. If you made a copy of a directory, the tool will show you the inner files/folders like a tree directory which is easy for you to browse. It is recommended to review the duplicate files before you remove it, because some system files may also have the same name or size. Duplicate Cleaner has an option called “Selection Assistant” to select files by groups, dates, drives, folders, etc. You can also select a folder as your favorite and remove files that duplicate it in a different place. Delete the duplicate files safely by sending them to Recycle Bin or move them to another place to make sure that important system files and programs aren’t removed. You could also rename them for further usage. For advanced users, the Hard Linking functionality is offered. This superior visual comparison technique can locate images that have been flipped, resized, rotated or saved in an unusual format. The built-in image browser helps you to outlook the duplicate images depending on its size, date, and color depth. Duplicate Cleaner caches the repeated images by storing it with “fingerprints” and when scanned again, the fingerprint will be used to scan it against a new folder. Scan and Find the audio files of various formats such as MP3, WMA, M4A, M4P, OGG, AAC and WAV by tag information like Title, Artist, and Album. You can compare only the audio file without the tag information. Duplicate Cleaner shows you the list of any audio file with its length, bit rate or sample rate apart from the usual tag info. Filter by file extension, size, and dates. You can exclude system files/folders, zero size files, NTFS Mountpoints/Junctions and hard linked files. You can search local or network drives, UNC network resource paths, external device such as USB or Camera, in Zip files, etc. Duplicate Cleaner 3.0 has multithreaded scanning and deletion option with fully Unicode compatible which can load and save results or scan profiles. Summing up all the above, we can say that Duplicate Cleaner 3.0 is an exceptional file management and optimization tool for intermediate and advanced users. But, this tool is not recommended for novice users as they may remove needed files unintentionally without enough knowledge. 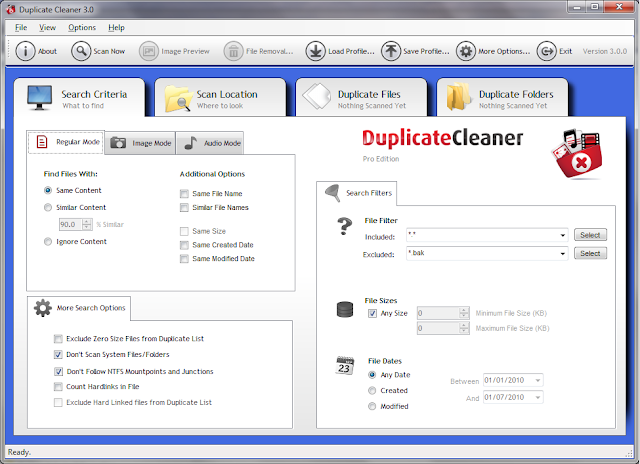 Download Duplicate Cleaner 3.0.1 which is supported by Windows 7, Vista and XP from below link. Many of us don’t know the media conversion formats at the time of encoding and decoding. In such situations, media codecs will definitely help more than necessary. 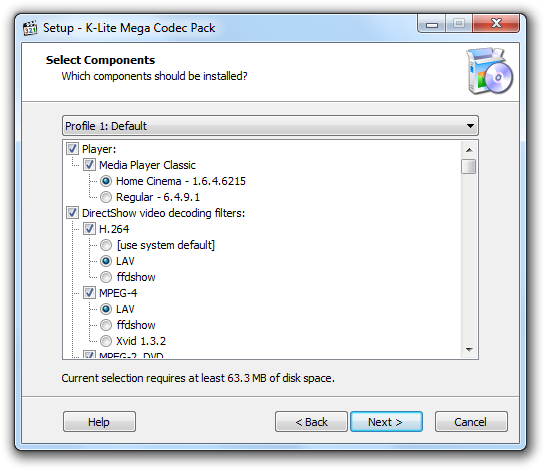 K-Lite Codec Pack is a one of the popular audio and video codec software with complete formats such as VFM, ACM, DirectShow filters, etc. which are required to encode/decode audio and video with user-friendly design and intuitive navigation. 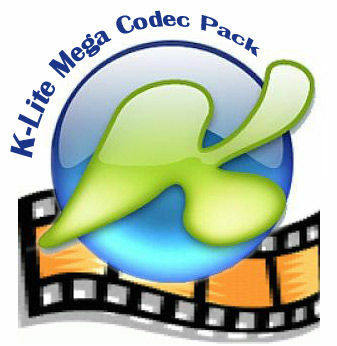 K-Lite Codec Pack Full 9.8 is the latest version updated with LAV filters, Codec Tweak Tool and Icaros. 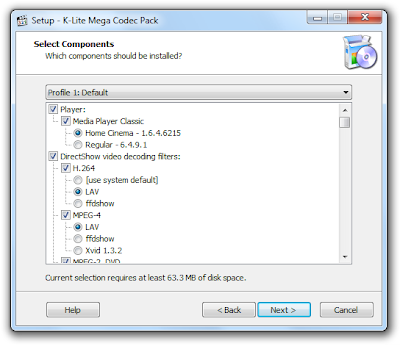 The major advantages of K-Lite Codec Pack Full compared to other code packs are updated codec versions, fully customizable installation, does not include conflicting codecs and a complete enclose of everything you need to play your favorite videos. The latest version offers three installation modes – Simple, Advanced and Expert. In Simple mode, users are provided with application’s default options whereas in Advanced mode, it shows all the options that are previously unlocked. In Expert mode, you will be supplied with extra options which are not available in Advance mode. For beginners and naïve users, Simple and Advanced modes are enough with default profile. The Expert modes offers wide range of video formats like Flash, MPEG-2/4, VC-1, VP7, etc. Some component levels are able to handle multiple formats thus fully tweaking the user specific needs and preferences. The changes made through Codec Tweak Tool and the Configuration Menu in the program will help in tweaking the performance of media player. Download K-Lite Codec Pack Full 9.8 from below download link for free. With basic protection against viruses, malware, Trojans, worms and other threats, UnThreat Free Antivirus 2013 does commendable job in security your PC. It includes the latest “On-access” technology with full-featured antivirus solution. The security suite also consists of Anti-rootkit and Mail Cleaner which are required for necessary web protection. 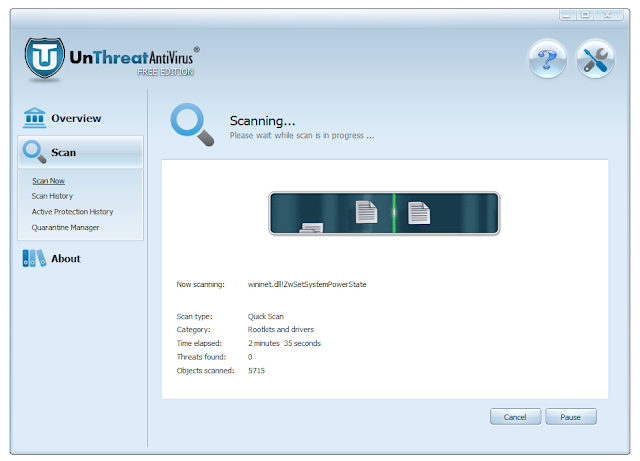 The new version UnThreat Free Antivirus 2013 has some bug fixes, improved stability & performance, improved antivirus engine and Windows 8 compatibility. UnThreat Free Antivirus 2013 requires a reboot after the installation process. The interface is clean and simple with security controls placed on left-side. As this is a free version, some features are disabled such as Firewall, RoadWarrior, and Web Guard. Although it doesn’t make a weak antivirus, UnThreat has well-equipped with enhanced protection features. Antivirus Protection (Upgraded) – The improved Antivirus engine can scan your PC vigorously, detect and remove viruses, worms, malware, spyware and other malicious threats that infects through internet downloads, removable storage, mail attachments or any other medium. Anti-Spyware Protection – It detects and prevents dangerous softwares that are installed in your PC without your permission to steal personal information such as passwords, bank account details, etc. E-mail Protection – Scans inbox, sent mails and other mail components for spam content which may include attached virus. Active Protection (Improved) – Protects your PC from all kinds of attacks and monitors all system processes, files and programs and notifies you of suspicious activities. License Manager – Informs you regarding software license, expiry date, and special offers. Update Manager – Downloads the latest virus definitions frequently without manually setting on by you. UnThreat Free Antivirus 2013 also is reliable option with necessary features, effective controls and strong protection which is recommended by experts even through many popular free versions are available. You can also buy the Total Protection tool - UnThreat Internet Security 2013 with 50% discount or download a 30-day free trial. Kaspersky delivers security version – Kaspersky Mobile Security 9 for mobiles which is used to protect your personal data from malware, identity threats and in the case of theft or loss. Because many online transactions are done through mobile, the sensitive information such as contacts, messages, credit card details, etc. should be kept safe if you want to sustain your mobile for longer years. 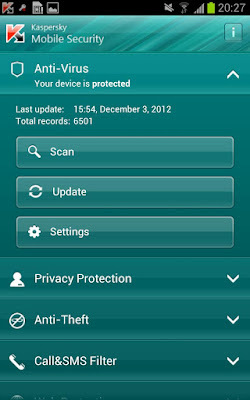 Kaspersky Mobile Security 9 is the latest version optimized for Android, Symbian, Blackberry and Windows mobiles. The download charges are free, but you can also download the premium version of it for $14.95 for 1 year/phone. The premium security version has more enhanced protection features that will keep your Smartphone safe. Let’s check out the free and premium features briefly. The interface of Kaspersky Mobile Security 9 is very simple with well-built online component, but has issues when used frequently. When you install the product, it will prompt you to create Kaspersky account which is done is highly recommended because the messages and reports are sent to your account when your phone is lost or stolen. The password should also be strong enough with 12-digit length. 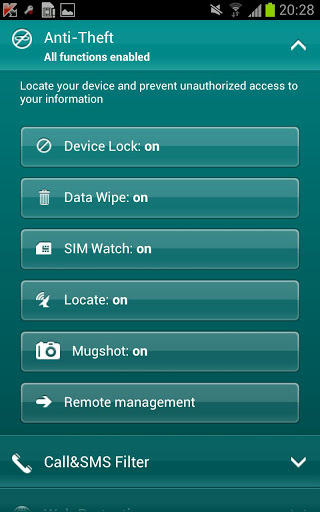 Your phone may be lost or stolen, in that situation the “Anti-Theft Web Management” provides complete control so that you can access your phone remotely with activated anti-theft commands. You can see the succeeding results in recent log information. With “Lock and Locate” feature, you can send a customized message to your missing phone and block it right away to conceal your private data. Kaspersky Mobile Security also utilizes GSM, GPS and Wi-Fi connections to show your missing phone’s location via Google Maps. Wipe out entire personal data such as call history, text messages, contacts, social network accounts, etc. when you are unable to recover your missing phone. This can be done remotely through “Data Wipe” feature. You can also delete complete data on SD Card and reset the device to default factory settings remotely. When you are nearby the missing location, you can activate the “Alarm” function so that your phone produces a loud sound. The “Mugshot” feature helps in taking the photographs of the person who took your phone without authorization. The images are directly to your personal Kaspersky account. If the SIM card is changed, the new number will be messaged to the Kaspersky account. As internet is the main medium of security threats, your Smartphone has to be protected against malicious and fraudulent links and phishing text messages. This can be done using Kaspersky’s Secure Browsing and the new Text Anti-Phishing features. You can check the downloaded apps and files using on-demand scans which include Full, Folder, Memory and installed apps scans. The anti-malware features provide real-time protection against emerging threats. You can set the automatic scan for your downloaded and updated apps. Make a list of trusted and unreliable phone numbers from incoming calls and texts and create Whitelist and Blacklist, where the Whitelist has the trusted and Blacklist has the unwanted numbers. 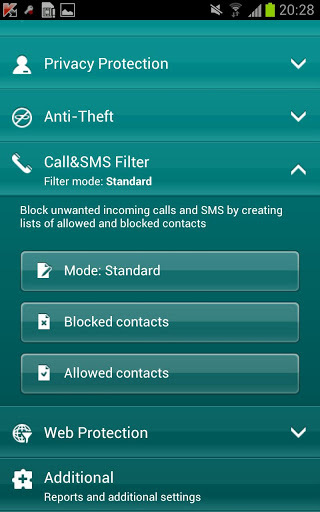 You can automatically block calls & texts from unknown, hidden and non-numeric numbers. Filter the numbers by text messages or calls or both. You can control what others can see and access whenever they pick up your phone such as hiding contacts, calls, SMS texts and logs with just a single-click. Kaspersky Mobile Security 9 supports Android 2.2 to 4.2 versions with minimum 320x480 resolutions. Look at the supported platforms and its features below table. You can download Kaspersky Mobile Security 9 from Kaspersky official website from Google Play. Every game player wants a smooth and clutter-free gaming experience, but to some extent many programs consume more than required resources in PC. Thus, the performance level also drops off and the gaming speed would slow down. 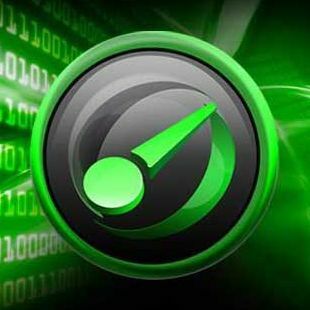 To boost the gaming speed and obtain the best performance out of your computer, IOBIT and Razer team has developed an amazing tool called Razer Game Booster, which will enhance PC performance by shutting down the needless system resources. 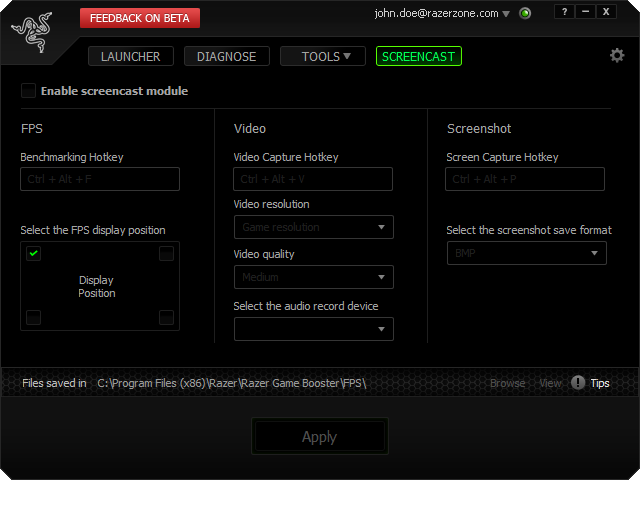 The latest version Razer Game Booster 3.5.6 has some tweaks and geeks. The newer version is compatible with Anti-cheat softwares like PunkBuster, Cheating-Death, VAC, etc. The concept of disabling the system resources is not new to many PC users, but there are no dedicated tools especially for gaming progression and optimization. Razer Game Booster is listed in Maintenance and Optimization tools, where the top contenders such as CCleaner, Wise Care 365, and Windows Doctor are present. 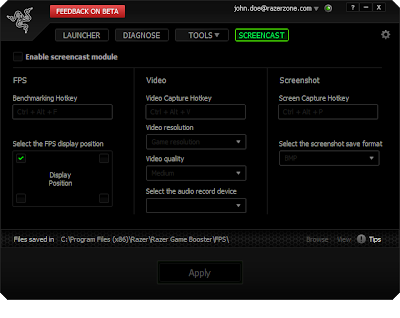 The perception of Razer Game Booster is very simple. It works in three modes – Game, Calibrate and Share mode. We’ll see each of them briefly. It customizes the system settings for gaming, cleans RAM, strengthen processor performance and temporarily shut downs the background processes. All these things happen as soon as you switch to “Game Mode”. In the Game Mode, you can pick up your favorite game listed and click the “Launch” button to perform the above task of optimization. You can also configure the processes in “Temporarily Shutdown Settings” as it also provides the in-detail information of your PC like memory, running services, CPU usage, etc. In Calibrate Mode, you will be provided with options like Tweak, Defrag and updating outdated drivers. Razer Game Booster finds the outdated hardware drivers and installs them instantly. 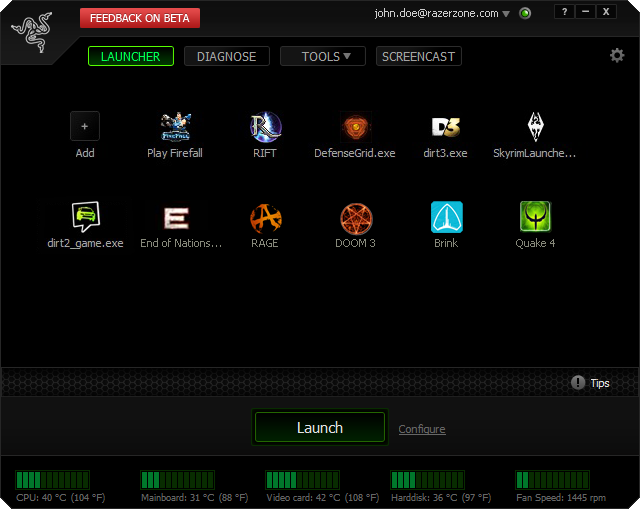 Secondly, with “Tweak” tool you can automatically analyze your PC and improve all game settings. Finally, using “Defrag” tool you can manage the game file folders to run more effectively. 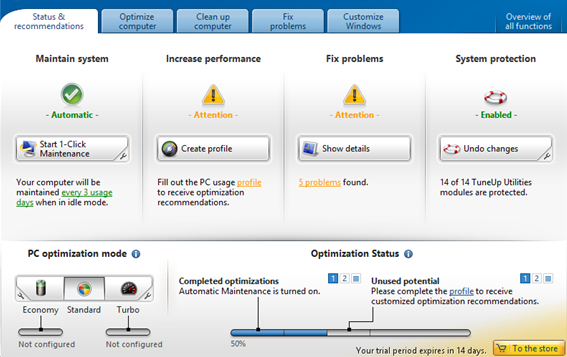 The “Tweak” tool includes an “Expert Mode” where you could access various processes and services for optimizing. You can also restore or rollback the tweak settings to Windows defaults. Record your favorite game using “Share Mode” where you can create tutorials and witness real-time audio/video. You could also capture screenshots in “Share Mode”. Customize the way you show/hide your frames per second, record high-quality Gameplay footage and screenshot in-game capture. You can share your much loved gaming moments and scenes with your friends. The problems found in Razer Game Booster are with some titles, minimal increase on tuned systems and there is a big list of features which is both confusing and annoying. Although it has some cons, Razer Game Booster 3.5 is highly-recommended if you are hard-core game player and wants smooth gaming experience. Download the latest version with the below link. If you are fond of creating wonderful and imaginative things such as crafting or building structures, then Minecraft will be your best time spending game. Minecraft, as the name says you have to build innovative structures with given blocks at first. But as the game progress, you have to secure the crafted building from night monsters by safeguarding it with another crafted structure. Minecraft is a game of time-passing and mind-bending testing your innovative and imaginative skills. The graphics of the game is not at all impressive and has no real direction or plot to guide you as the game progresses. You will be just given a land to build a world of your imagination with the provided resources. You can skip the graphics part, if you don’t have a problem with it even if it looks ugly. Minecraft game was developed by Markus “Notch” Persson, a Swedish programmer and later on a full version was released on November, 2011 by Mojang. This game was developed and released on many platforms such as Android, iOS, Xbox 360, including the PC version. There are four Gameplay modes available in Minecraft PC game namely, Survival, Creative, Adventure, and Multiplayer mode. In the first mode i.e. 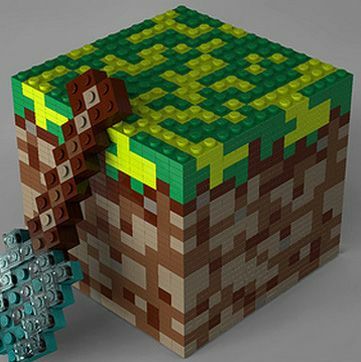 Survival mode, players have to collect natural resources around the environment for crafting definite blocks and items. In Creative mode, players can instantly place or remove items and resources through the inventory menu. In the Adventure mode, players could knowledge user crafted custom maps and adventures. Coming to the final mode – Multiplayer, it enables multiple players to act together and communicate through local area network or interconnected computer without a server. As Minecraft does not provide any “Help” file or guidance to teach you the sustenance in the game, you have to search online for custom guides to get the most out of the game. Minecraft’s comfortability zone is very-low for inexperienced users, but when playing on a network, the gameplay and mechanics would be just fine. 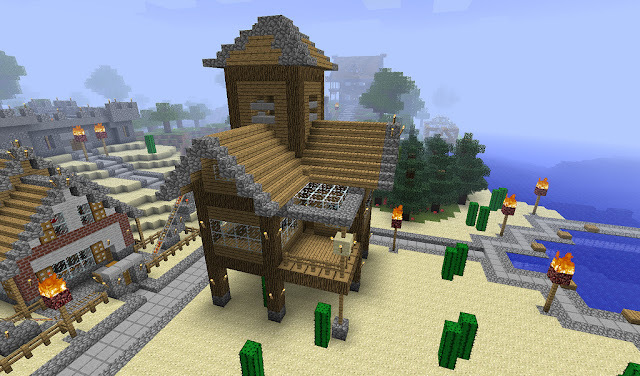 You can download different free or trial versions of Minecraft which include PC, Android, iOS and Xbox 360. The game is supported in all Windows OS except Windows 8. With the advent of the Amazon Kindle, the reading habits were changed completely that you could read books, magazines and other web content simply by touching the small screen. Dedicated apps have been developed for Amazon Kindle to suit its experience and compatibility. Slowly the eBooks read on the device are being called as Kindle books. Now, if you don’t have a Kindle device it’s perfectly alright as you have “Kindle for PC”. Kindle for PC actually was also developed by Amazon.com company to increase the Kindle-users who could not afford to buy or lost the devices. This is a very simple and handy application as you can access every Kindle book without having an Amazon Kindle device. How to use Kindle for PC? Firstly, you must have an Amazon.com account in order to access the tool. If you don’t, the application prompts you for registration at startup. 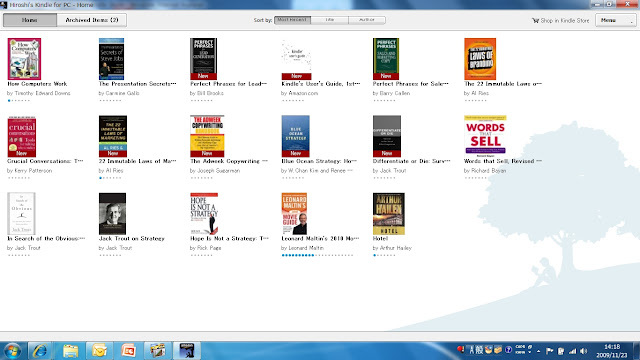 The interface looks very simple and easy to browse and manage the Kindle book library. If you want to read it, just double-click on the desired book. You can find a phrase or a location using “Search” function and jump to desired chapter. You could also alter the font size, change the color mode or jump to Full-screen for improved reading experience. Can be accessed only with official Amazon.com account. You can buy, download and read thousands of books offered in the Kindle Store. Read children books, travel books, cookbooks, textbooks and graphic novels in full color. Display complete definitions when a word is highlighted or selected using a usable dictionary or you can search online directly from the application. Preview the first pages of any book for free before you purchase. You can access previously purchased Kindle books stored on Amazon’s servers for free. You can choose 10 different font sizes to suit your reading experience. Automatically synchronizes all your bookmarks before logging out the session. Remembers the last read page for easy access. You can view the highlights and notes marked on Kindle, Kindle DX, iPhone and iPod touch. For Windows 7 users, there are options such as Zoom in/out, Turning pages effect, etc. For digital book lovers, this useful software can be great for reading customized e-books even if you don’t have a Kindle device. 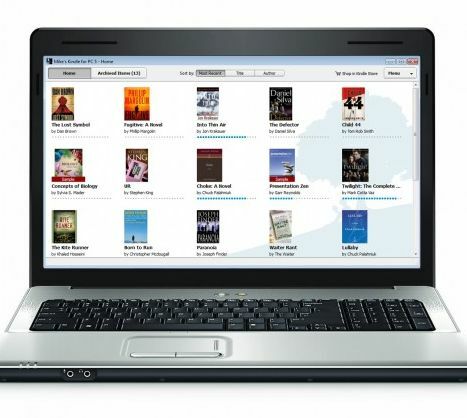 Kindle for PC is free to download which supports Windows 7, Vista and XP operating systems. Until now, the Internet Explorer 10 was merely available in Windows 8 OS. But Microsoft has rolled out IE 10 for Windows 7 users too, as the company has 700 million Windows 7 users around the globe. The latest update has brought big smiles on Windows 7 users and there are many reasons to have. The latest edition is more faster, standards-compliant and even better than the current IE for Windows 7. Also the modern HTML5 websites run more smoothly in IE 10 on Windows 7. 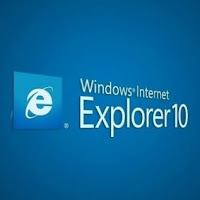 Overall, Internet Explorer 10 has 20% faster for real world websites and 60% increase in supported modern web standards. It starts loading websites instantly like a fluid and this responsiveness feels more comfortable to handle. Full-screen browsing truly enhance the experience of web surfing like tiles and tabs for repeated visited websites. Faster navigation with innate and smooth controls. Now you have both address and search bar on one box for quick navigation. SmartScreen Technology – Protects your PC from internet malware and keeps your personal information safe and secure. The latest supported standards include HTML5, CSS3, DOM, Web performance and application. Web development features such as creating visually rich effects, more refined and responsive page layouts, improved programming model, interactive web applications, and enhanced web application security. 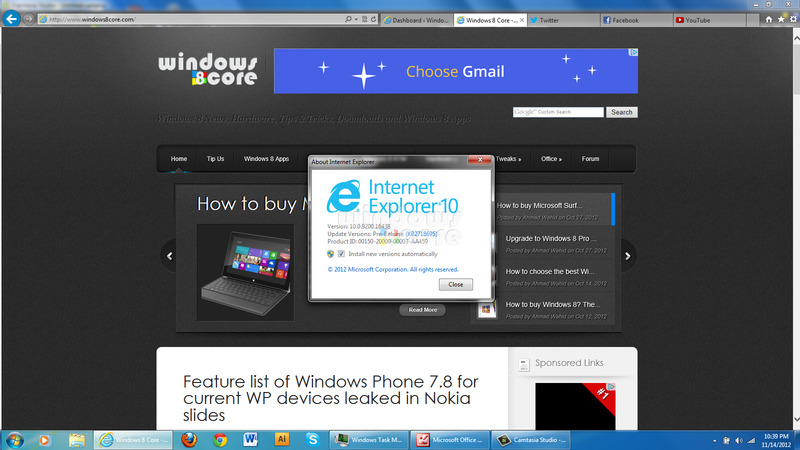 The interface has been really the amazing feature in IE 10 which now has single box for both address and tabs. The latest update as said is more stable with complete set of features which are present in Windows 8. 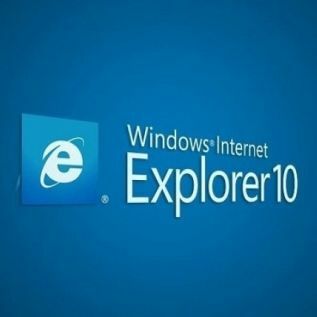 You can download Internet Explorer 10 for Windows 7 from Microsoft official website along with Bing and MSN defaults, if you choose to have.